On Sunday, October 26, 2013, was held in the sports hall in Nymburk 20th WITTE Automotive Czech Championship of men singles in footnet. The victory was finally celebrated by Michal Kolenský of TJ Spartak Čelákovice, which he joined in specially made "Čelákovice" blue edition of „botas“ footnet shoes. 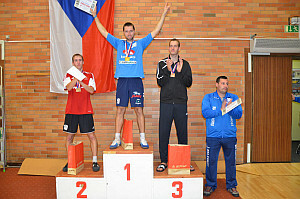 In the final, he defeated a double Czech Champion Karel Hron.